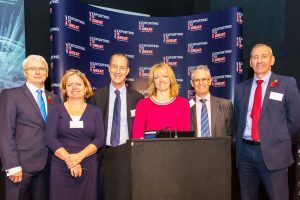 WOKING played host to the highly successful international business engagement roadshow, Kick-Start run by the Department for International Trade (DIT) South East. The interactive event, at the HG Wells Conference & Events Centre last Wednesday, was designed to provide businesses new to exporting with all the essential information and practical tools needed to take the first steps towards exporting success. More than 45 local companies heard from DIT, Microsoft and Barclays experts, as well as local companies such as Sesame Access on their exporting journeys and overseas experience. Companies had the opportunity to meet one-on-one with DIT International Trade Advisers to discuss their own export plan and listen and engage with specific export advice sessions on the likes of overcoming challenges, the benefits of exporting, market selection and the practicalities and process in exporting. The roadshow is part of the Exporting is GREAT campaign which is working with the public and private sector to inspire and support more UK businesses to sell their goods and services overseas. The campaign is designed to encourage and enable UK businesses to take advantage of the global appetite for UK products, services, skills and expertise in markets around the world.